Club Monaco Boxing Day sale for 2013 starts on Thursday December 26th and ends on December 29th, 2013. Take an extra 40% off already reduced merchandise in-stores or online. 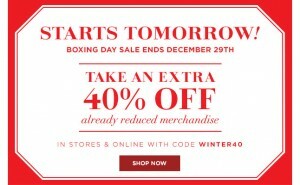 Use Club Monaco Boxing Day coupon code WINTER40. Shipping is free if you spend $150 or more. Free Shipping offer is valid on all orders more than $150 shipped in Canada and applies to Standard Ground shipping orders only. The $150 threshold applies to merchandise only. Taxes and additional shipping and handling (if applicable) and the purchase of gift certificates and gift cards do not count toward the qualifying amount. The total order amount after any discounts are applied must be more than $150 to qualify. Not valid for cash. Previous purchases are not eligible for adjustments. If you choose to ship Standard Ground and are shipping to multiple addresses, you will receive free shipping only to those shipping destinations receiving more than $150 of merchandise. If an address is receiving less than $150 in merchandise, you will be charged for shipping accordingly. Void where prohibited by law. Offer is valid December 26 through December 29 , 2013 (11:59pm PT) on ClubMonaco.ca. Discount is applied to your order at checkout. This discount can be applied to sale and clearance items only. This discount cannot be combined with any other offer. Offer not valid for previously purchased merchandise, has no cash value, and cannot be used to purchase gift cards. Void where prohibited by law. CODE: WINTER40. Boxing Day has arrived! 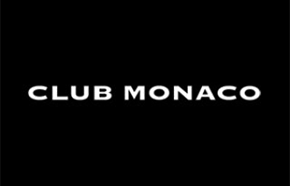 Now, take an extra 50% off already-reduced styles at clubmonaco.ca. Between December 26th and 31st use the promo code SAVE50 during the checkout process to redeem this incredible deal! Avoid the lines and avoid the crowds, this year just login and start shopping online.